Insure your travel to cover the expenses of the loss of health and property you incur during unforeseen incidents while you are traveling. These events include earthquakes, floods, thefts, flight cancelation, misplacing of luggage etc. 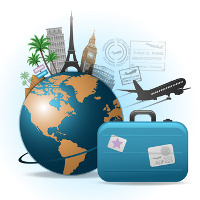 With our travel insurance services, we help you get the best travel insurance deals available in the market. Our travel insurance agents will clearly explain you the insurance policies and their terms and conditions so that you select the best policy for your travel. We are based in Dumdum, Kolkata and we operate throughout the state of West Bengal. So, acquire our travel insurance services, and make your travel sorted & secure.